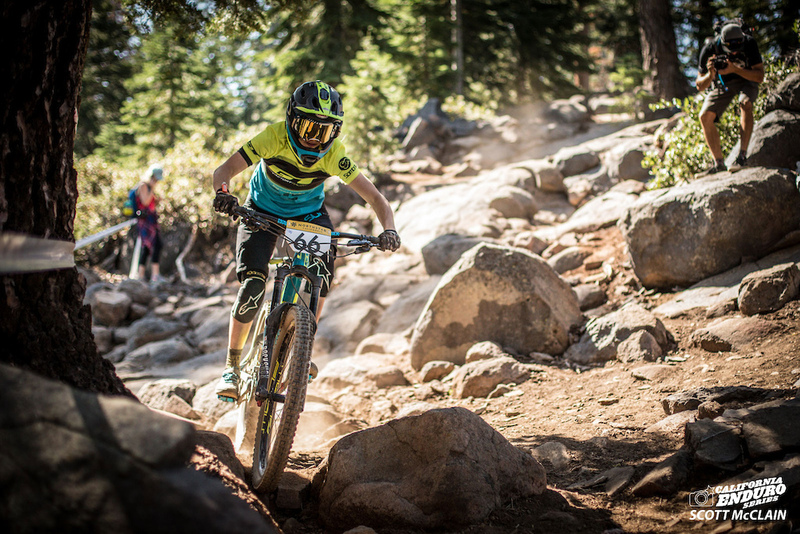 After six races covering a huge variety of terrain from Oklahoma to Vermont to New Mexico, the first inaugural IMBA National Enduro Series presented by Slime came to a close at Northstar Resort in Truckee, California. 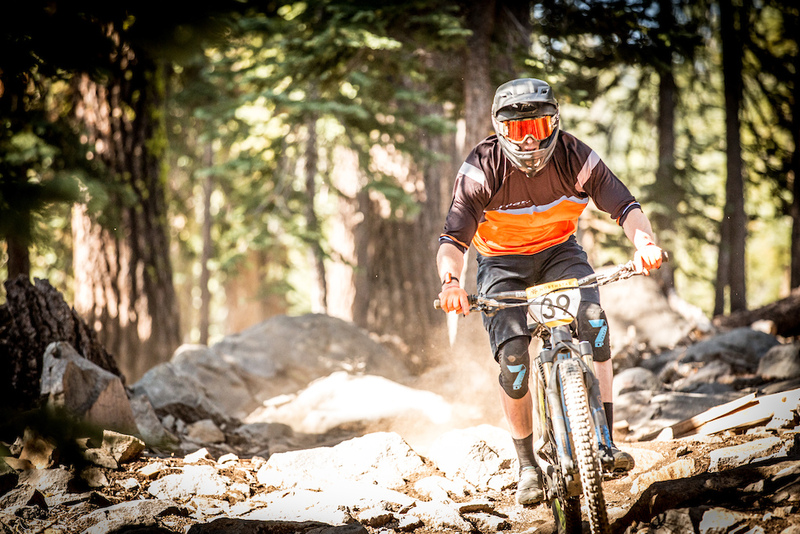 The final round of the series was put on by California Enduro Series and was part of the CES Golden Tour. 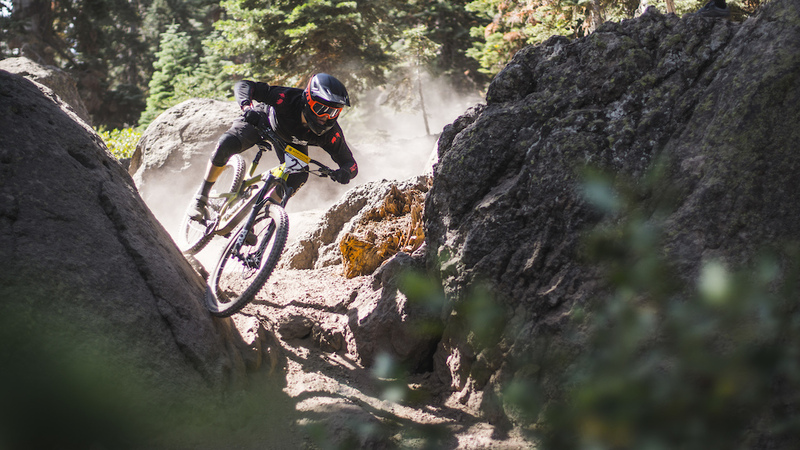 The competition was fierce and the trails were challenging, with blown out conditions and many technical rock gardens designed to test riders’ limits (and equipment). Georgia’s Terri Watts (706pChicks) went into the race with a modest lead over California native Rachel Strait (GT Factory Racing) in the Pro Women’s category, but her lead shrunk considerably after two flat tires on the first day. This made for an exciting second day of racing, and some tense moments as points were tabulated. In the end, Strait finished 6th on the day, one position off from taking the title away from Watts. Watts came out on top after six races, but only by a margin of 22 points. Emily Cox (706pChicks) was unable to race this round due to a concussion incurred at round five of the series but held onto her third place position in the points. 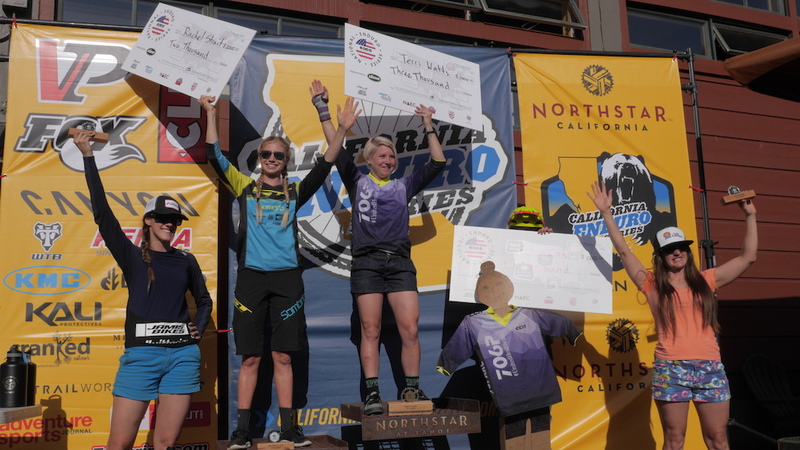 Fourth place went to Syd Schulz (Jamis Bikes – Vittoria), and Amanda Propst (Lee Canyon) narrowly beat out Porsha Murdock (Juliana Bicycles) for the final podium position. On the Pro Men’s side, Jimmy Smith (Kuat Racks) and Scott Countryman (Kona Bikes) went into the final race in a dead heat. Both riders suffered some bad luck over the course of the weekend, and at the end of day two, Countryman finished in 11th and Smith in 18th. Countryman was only a few points (one place) away from overtaking Smith in the overall. In the end, the two were separated by only six points, with Smith taking home the title. 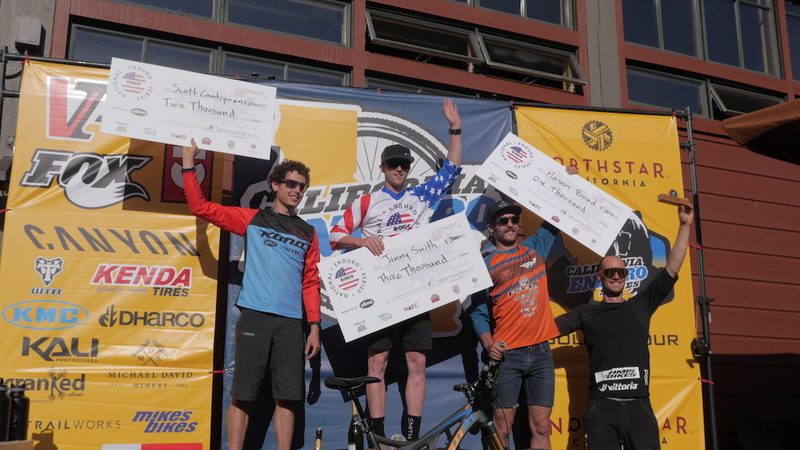 Mason Bond (Pivot Cycles) overtook Seamus Powell (who was unable to race this round) for the final paying position, with Macky Franklin (Jamis Bikes – Vittoria) rounding out the podium in 5th. In the U21 Men’s category, Nic Bean continued to open up his lead over 2nd place Jake Yackle, clinching the national title. Third place Layton Meyers was unable to race this round but still held off the competition for the third position. None of these riders are older than 18, so expect to see them continue to dominate the U21 category for the next few years. 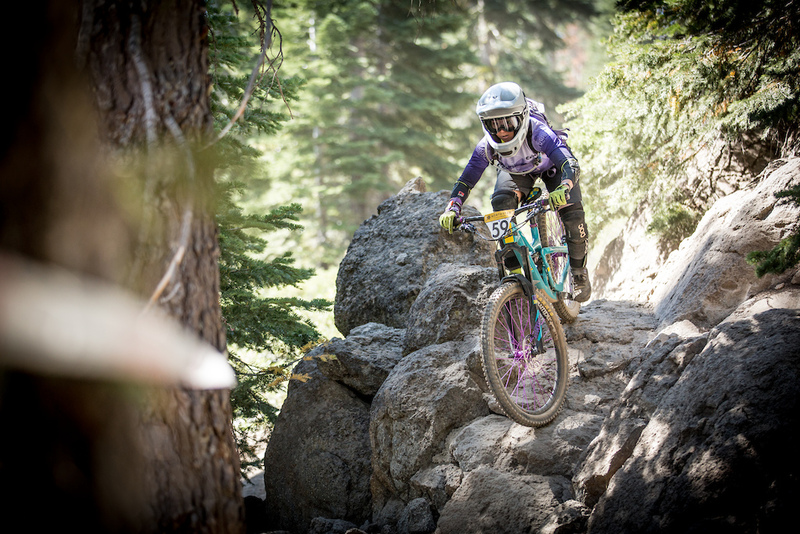 With stops in Oklahoma, New Mexico, Idaho, Vermont, West Virginia and California, the IMBA National Enduro Series presented by SLIME tested racers on a variety of conditions all over the country – everything from wet roots and rocks in Vermont, to the blown out rock gardens at the finals here in Northstar. “We were tested on nearly every aspect of racing to bring out the best all-round rider,” says second place pro man Scott Countryman. Huge thanks to IMBA and Slime for making this series possible! Scott Countryman is my local shop guy here in Flagstaff, AZ (Flag Bike Revolution). Great guy, down to earth and always willing to help me out with my bike, usually right on the spot. Nice work out there Scott, proud of you buddy! Flag Bike Rev is one of my favorite shops in the whole country. Everyone there is top notch! Congrats Scott! It's been fun following your up-and-coming career. Killin it Jimmy, nice work! Sounds a bit like the NORBA NCS back in the 90's. Massive variability in tracks and venues all across the country, DH racing on Saturday and a fun party to follow. It was a great way to spend the summer. I have known Terri for quite sometime and it is great to see her busting into the seen with vengeance! Congrats Terri!!! Hope this Series continues. 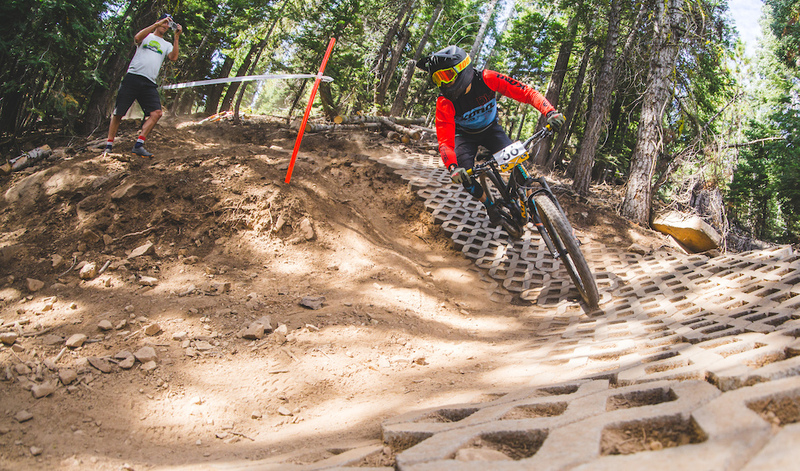 I think they did a great job trying to grow the sport of MTB Enduro in the States to a National level of competition. Way to kill it, Terri! IMBA enduro? Did they win on cross bikes?